Magnesium trisilicate is also known as “magnesium orthosilicate”. The chemical formula is Mg2Si3O8•nH2O and white orthorhombic crystal with melting point of 1910℃ and relative density of 3.21. This product is insoluble in water or ethanol. It is decomposed into Mg(OH)2 in concentrated alkali or decomposed into silicic acid and magnesium chloride in hot hydrochloric acid. It can be decomposed by hydrofluoric acid. It exists as forsterite mineral in nature. Due to the openness of its crystal structure, it contains holes and channels which are connected with each other as well as the outside world, and has a more developed pore structure and a large specific surface area, thus it has better adsorption performances and molecular sieve functions, which can provide specific acting force of the molecular field. In medicine, it has a lesser effect on neutralizing gastric acid, but slow and lasting, up to 4~5 hours. It is suitable for the treatments of stomach and duodenal ulcer. It also can relieve symptoms caused by hyperacidity. In addition, it can be used as processing aid or polyether adsorbent, which has the function of adsorption and decolorization. The product has broad application prospects in the pharmaceutical intermediates, food additives, rubber filling agent, deodorant, ceramic industry, and other fields. The product is antacid with slow and long-lasting effect, it does not produce any gas thus protecting the gastric mucosa, and it has the function of light diarrhea and adsorption. Insoluble in water. It can absorb the free acid in stomach, so it plays the role of making acid. The function of neutralizing peptic acid is weak, slow but long-lasting, up to 4~5 hours. The hypocatharsis of antacids containing magnesium can lead to defecation. About 10 % of magnesium can be absorbed by the intestine. In the process of neutralizing gastric acid, there is no carbon dioxide but colloidal silica, which is covered on the surface of ulcer and has protective effects. It can also absorb enterotoxins, bacteria and harmful gases. Large doses have the function of light diarrhea. It is clinically used for hyperacidity and peptic ulcer. 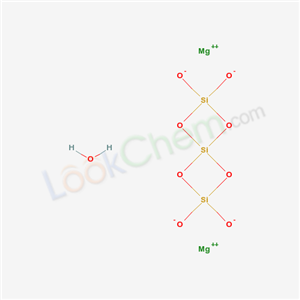 A certain concentration of Na2O•nSiO2 solution and Mg(NO3)2 solution are respectively prepared by using sodium silicate with chemically pure modulus of 3.34 and chemically pure Mg(NO3)2 as raw materials. According to n(Si):n(Mg)=2:1, Mg(NO3)2 solution is dripped into Na2O•nSiO2 solution at a speed of 5 ml /min and stirred at the same time with the appearance of white precipitate. The mixture solution is aged after 1.0h’s standing after dropping. Then this product can be obtained through preparation of filtering, washing, precipitating to a neutral stance and oven drying. Long-term use of this product may cause renal tubular silicon stones, thereby damaging the renal tubules. Therefore, in the treatment of gastric ulcer, its potential toxicity should be noted. Vertigo, convulsions, arrhythmia, mental symptoms and abnormal fatigue may occur in patients with renal insufficiency or a large number of long-term use. It is contraindicated in patients allergic to the product. It should be carefully used during the first three months of pregnancy. When combined with atropine, digoxin, diazepam and isoniazid, it may affect curative effect of the latter due to the decrease of absorption. When combined with levodopa, the absorption may increase; chlorpromazine drugs can inhibit the absorption of this product. It is used medicinally as an antacid. It can neutralize the stomach acid and protect the ulcer with slow and lasting effects, up to 4~5 hours. It does not produce the gas to protect the gastric mucosa, and it has the function of light diarrhea and adsorption. It can be used to treat stomach, duodenal ulcer and relieve symptoms caused by hyperacidity. It can be used as antioxidant, deodorizer, decolorizer, TLC adsorbent, column chromatography adsorbent and so. It can also be used in ceramics and rubber industry. Food grade products are used as anti-caking agent, filter aid and film agent. According to regulations formulated by FAO / WHO (1984), the maximum amount of anti-caking agent used in powdered dairy products ( milk powder, cream powder, high fat milk powder and half cream powder ) is 10 g / kg.